Take plain sounds, simple sounds. And then you come along with your Jazz notes and your mortgage. 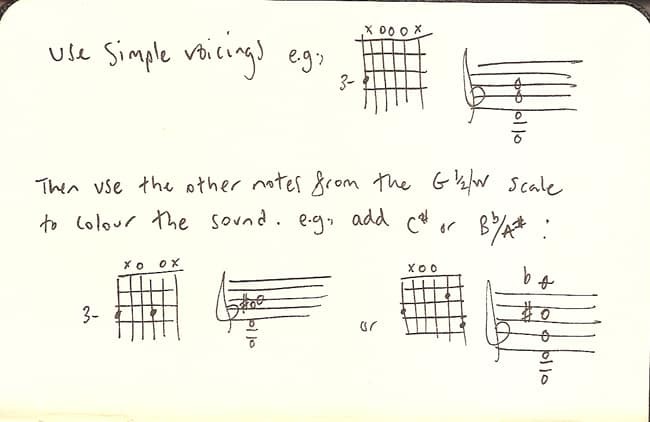 And you add one or two other notes from the diminished scale. A mélange of gritty urban realism and academic rectitude. Sweet and Sour, Yin & Yang, Yes & No, etc. Check out those chords above and you’ll hear what I mean. Just for your information, I label the chords as simply as I can. I don’t find it useful to label these kinds of chords like D-7(add4) G(add#11, no 3rd) C (add 9, add #11, no 3rd) or however the hell you’d write that! I think it’s better to just see the purpose of the chord and then understand what notes you’re adding and/or leaving out. Hear the sound of the chord, the movements of the inner lines, the common tones, the bass motion, the overall sonority, the strong elements, the unstable elements, etc, etc. Having the label sometimes gets in the way of hearing it.